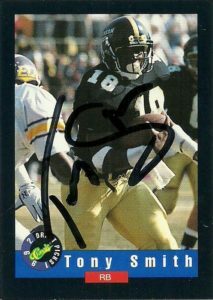 A speedy and dangerous all-purpose man while at Southern Mississippi, Tony Smith got to play alongside the likes of Brett Favre and Michael Jackson on offense. Over his career at the school he set school records, returning 2 kickoffs and 2 punts for touchdowns. 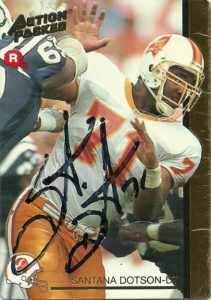 In 1991 he ran for over 1,000 yards, (5.1 yards per carry) despite wearing a cast on his hand for half the season. Tony culminated his college career when he was named the Senior Bowl MVP after rushing for 72 yards on 12 carries. The Falcons were in their 3rd year of the Glanville era. 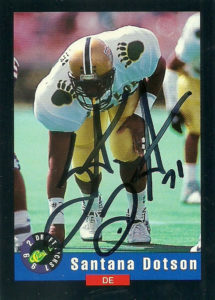 They traded away Brett Favre to the Packers, and cut future CFL career leading rusher Mike Pringle. The Falcons had an age purge at RB and the previous season they had failed to have any runningback reach 500 yards rushing. Steve Broussard and Erric Pegram would be the top backs out in the Red Gun offense. 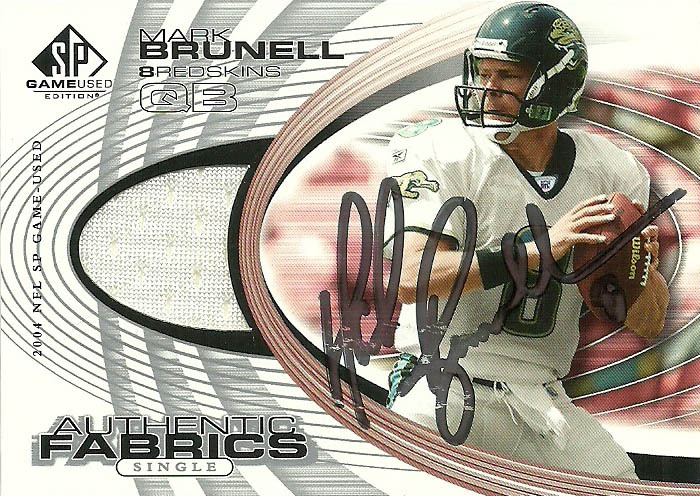 The team felt it still had a lot of needs, so Glanville was pretty unhappy when the team selected Tony Smith with the 1st round pick that they had gotten from the Brett Favre trade. You see Glanville didn’t have power over the draft and really thought the team should select a defensive back. (To put salt in the wound, Dale Carter, Darryl Williams, Ashley Ambrose, Darren Woodson, and Steve Israel all came off the board after this selection and had solid defensive back careers.) Much to Tony’s credit though- he was the highest rated tailback in the draft. Smith was slow to get into camp- and was considered a holdout. He’d be the last first round pick to sign from the 1992 draft. He was also the wrong style of back. Glanville liked smashmouth in-your-face backs, but Tony was a studder-step and make them miss back. 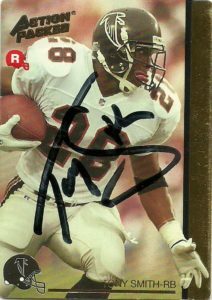 He got out there his rookie season and started 6 games posting 87 carries for 329 yards and 2 TDs, but oddly enough, he’d never start another game again for the Falcons in the next two seasons. 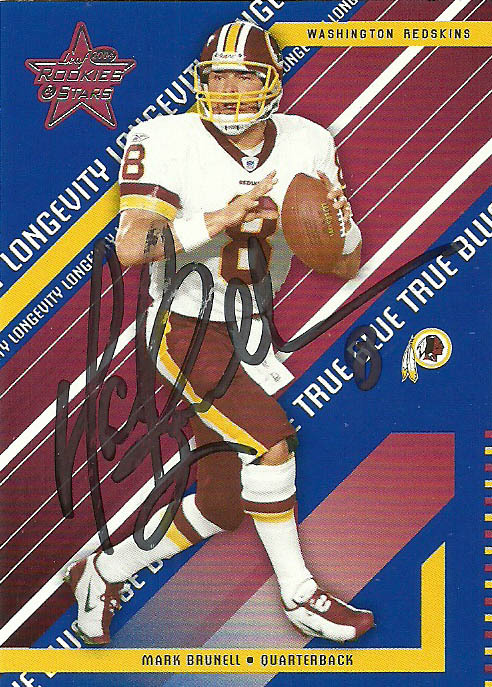 Fans clamored to see more of Tony, and I am sure Tony was ready to show them what he had, so he put some time in on special teams where he demonstrated his capability as a dangerous return man. He finished 1993 with 38 kick returns for 948 yards and a 97 yard touchdown. Smith also returned punts- putting up a respectable 32 returns for 255 yards and a 51 yard long. He saw even less activity in 1994- putting up only 408 total yards from scrimmage. Tony just couldn’t get out of Jerry Glanville’s doghouse. It looked like a new start for Tony in 1995. The Falcons left him exposed in Free Agency and the expansion Carolina Panthers were providing him a new chance. While Tony had an impressive preseason, he suffered a gruesome injury against the Bears breaking both his tibia and fibia bones. He spent the entire ’95 season on IR. 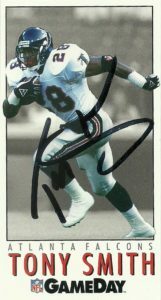 After rehabbing and spending a year away from football, Tony attempted a comeback with the Toronto Argonauts of the CFL in 1998. He returned to the NFL in 1999 with the Philadelphia Eagles- but tore his hamstring in camp ending his career. It is a shame that Tony’s career ended the way it did, but at least he is at peace with it. He had some great cards over that short run, with these 3 representing some of my favorites.